Portable and fixed Systems to monitor biogas and landfill gas composition With a global network of subsidiaries and distribution partners, SEWERIN Gas and Water leak location and detection equipment is available throughout the world. Two microphones are attached to a water pipe with a leak and both “listen” for the noise from the water leak. If they can both “hear” the water leak, the correlator, (combined with other data entered by the user), calculates the position of the water leak. Correlation is best suited to larger pipe networks such as network distribution pipes. Pressurised water pipes with leaks produce noise. Using electroacoustic ground microphones, or listening sticks, the user can often hear this noise and identify where the water leak is. This technique works well both indoors and outdoors. A tracer gas containing hydrogen and nitrogen is introduced into the water pipe with the suspected leak. The gas escapes from the leak point and is detected by the Variotec 460 Tracer gas instrument. Very successful leak detection method inside buildings, on customer supply pipes andswimming pool water leaks. Water leak noise loggers are attached to the pipe by magnets and “listen” for water leak noise during the, relative, quiet of the night. 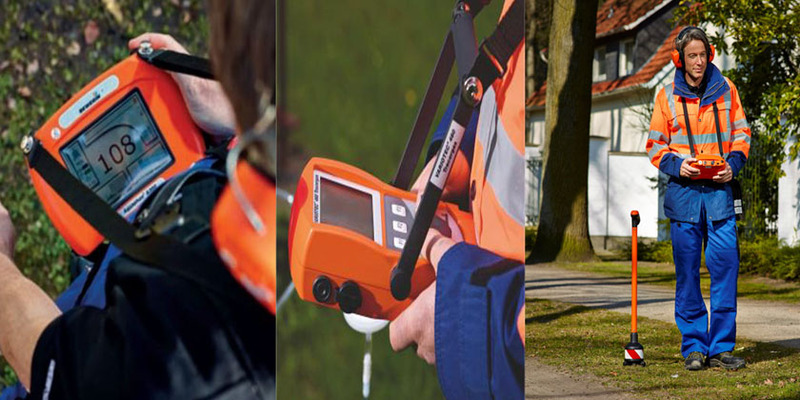 Water leak noise loggers are best suited for pre-location of water leaks (identifying the approximate area of a water leak before pinpointing the water leak) on larger pipe networks such as network distribution pipes.